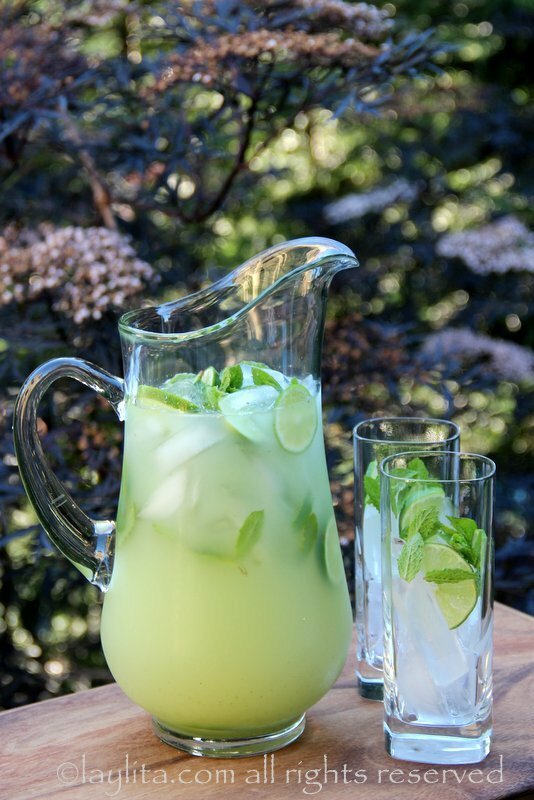 Here’s an easy recipe for vodka mint lemonade or limeade, this refreshing summer cocktail is made with limes or lemons, fresh mint, sugar or honey, water, ice and vodka to taste. I love summer entertaining, it’s great to be able to hang out with friends, and enjoy the warm weather. 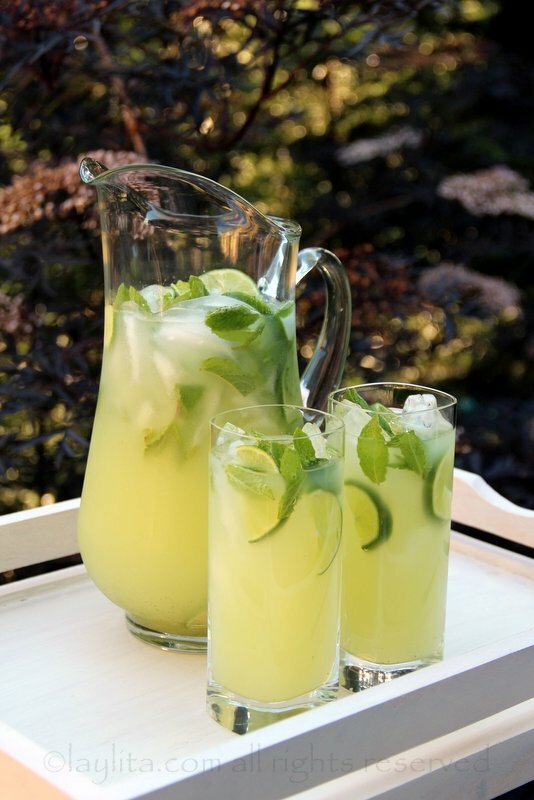 My main focus for most parties is usually the food (of course), but I also like to make sure that I have something refreshing for my guests to sip on. 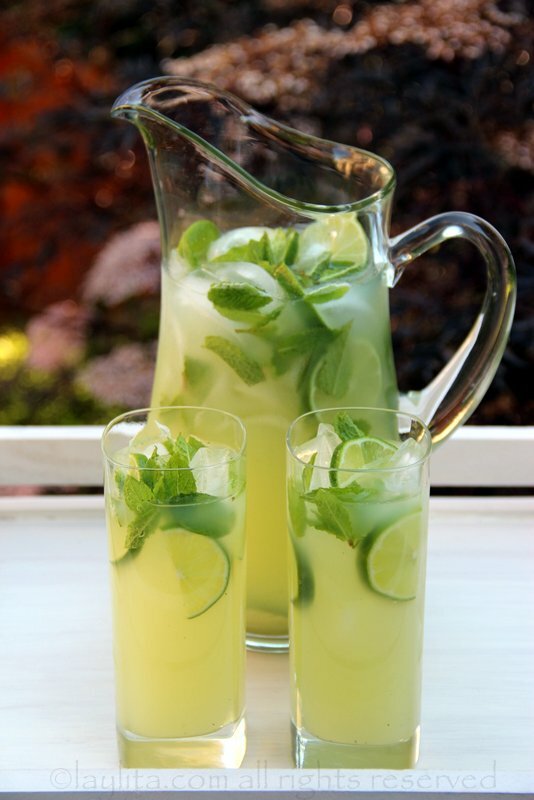 This vodka mint lemonade can be made quickly and easily – it literally takes less than 10 minutes to quarter the limes, blend them with the mint leaves, water, sugar/honey and ice, then strain them, add in some more water and vodka – serve with extra ice, lime slices and mint leaves. 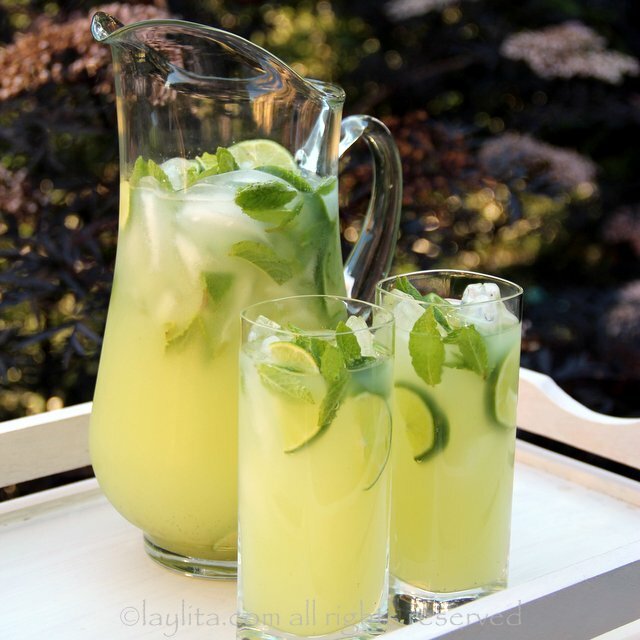 Easy recipe for vodka mint lemonade or limeade, this refreshing summer cocktail is made with limes or lemons, fresh mint, sugar or honey, water, ice and vodka to taste. 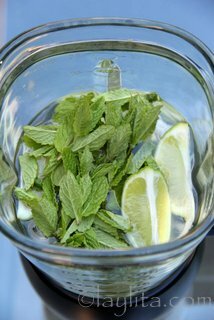 Place the quartered limes or lemons in the blender with 2 cups of water, sugar or honey, some ice, and half of the mint leaves. 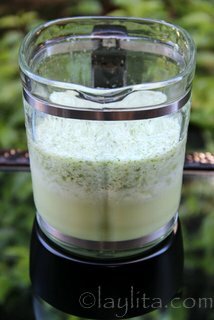 Blend until the limes or lemons are crushed, the mixture should be slightly foamy with a whitish color. Strain the lemonade and add the remaining 6 cups of water. 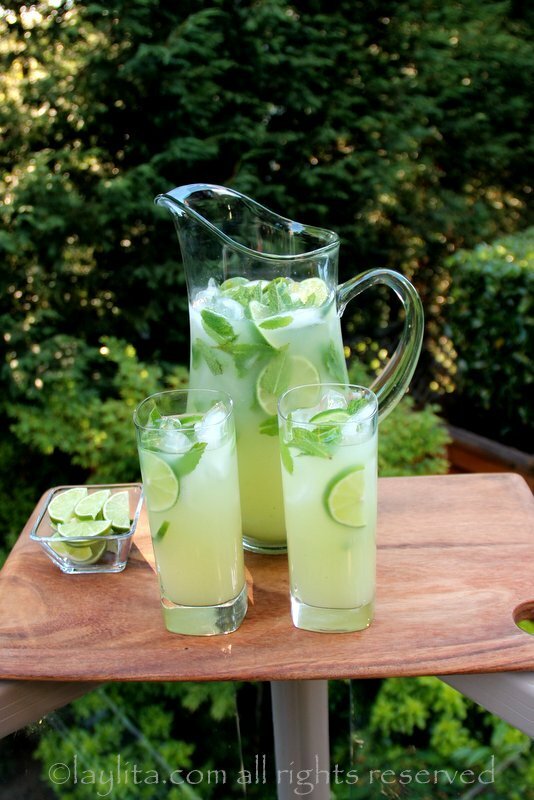 Serve with ice and garnished with the remaining mint leaves and lime slices. 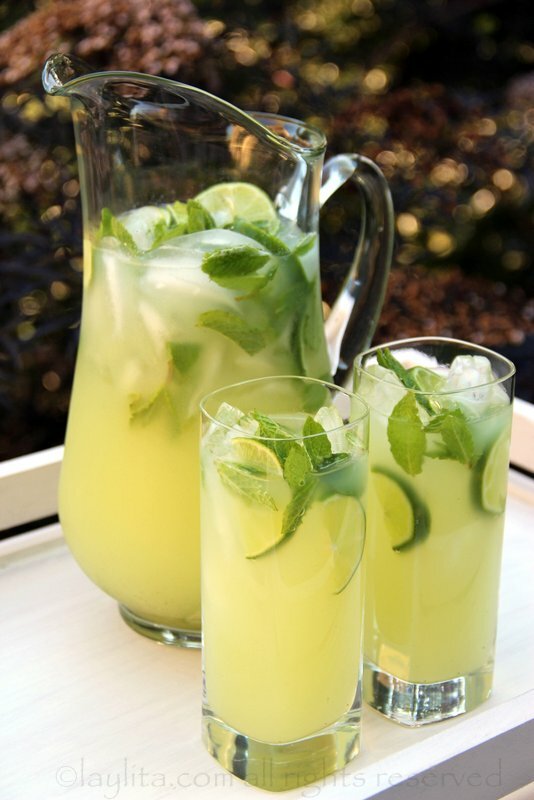 This lemonade cocktail is a twist on my classic limonada or limeade recipe made in the blender. As mentioned in that recipe, it’s so easy and efficient since you use the whole lime or lemon, the only caveat is that it must be consumed immediately or it does get bitter as time goes by. 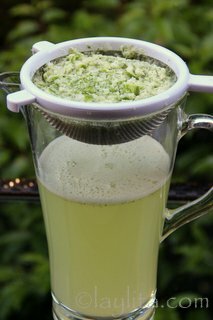 So while it isn’t the type of drink that can make it ahead of time, you can have the limes quartered, mint leaves washed and ready to go, so that it’s just a quick throw in blender preparation. I use honey in my vodka mint lemonade, but you can use sugar, simple syrup or your choice of sweetener, adjusted to how sweet you like it. Same with the amount of vodka, you can let the guests mix in the amount of vodka they prefer or mix in directly to the pitcher. 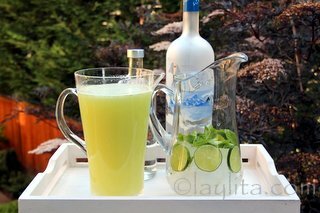 For a light drink I would use about 8 ounces or 1 cup of vodka or about 1 ounce to each 8 ounces (1 cup) of lemonade. 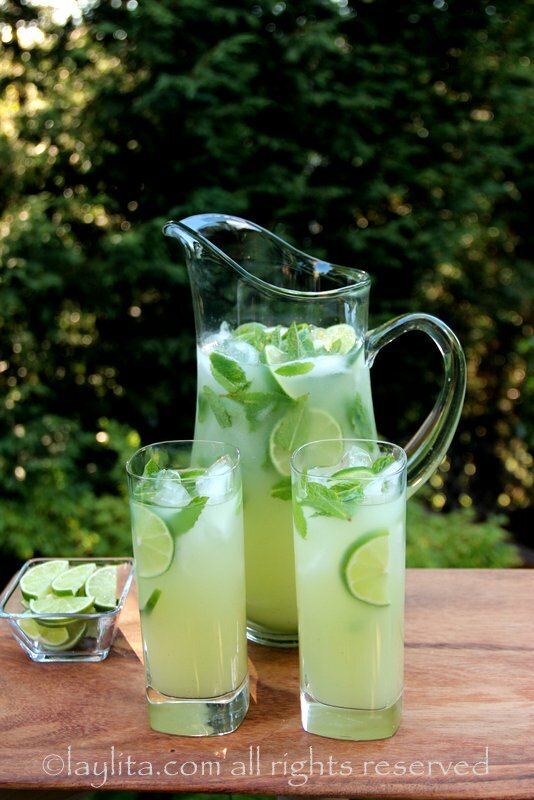 You can also prepare this mint limeade cocktail with other types of alcohol: try tequila for a margarita like drink, or rum and sparkling water for a mojito, if you love gin then turn it into a minty gin lemonade. 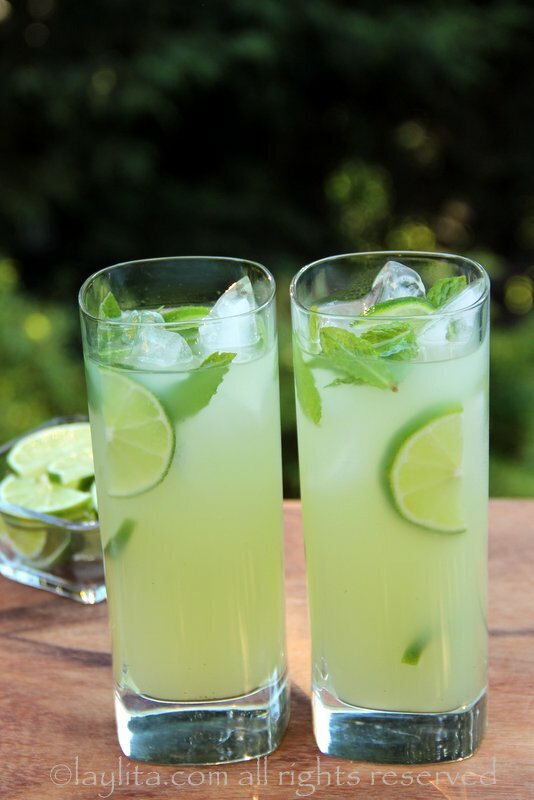 Of course, this cocktail is very easily turned into a non-alcoholic drink, just leave out the vodka and you have a refreshing mint lemonade or limeade. It can also be made into an effervescent or fizzy drink by replacing the regular water with sparkling water. I share Alla’s comment. I keep my Vodka in the freezer for a thick delicious shot with a twist of lime. Thanks for your lovely drink ,I will surely try it. I was just thinking this would be delicious with cachaca. Looks delicious! Great photos too btw. Very pretty cocktail! I only drink vodka super chilled as a shot – due my ukrainian origins- but as I was about to raise my hand and ask what else I can put into this, you provided like 50000 options!!! 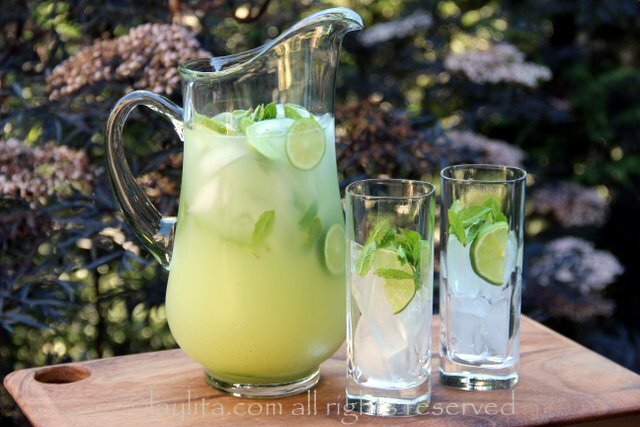 Love it, I will be trying this with tequila mmmm (maybe cachaca will also work as well?) And for sure also in a virgin version due to my current preggi status. Yes, cachaca will work also, so will pisco and aguardiente!